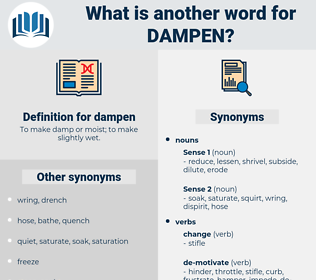 What is another word for dampen? 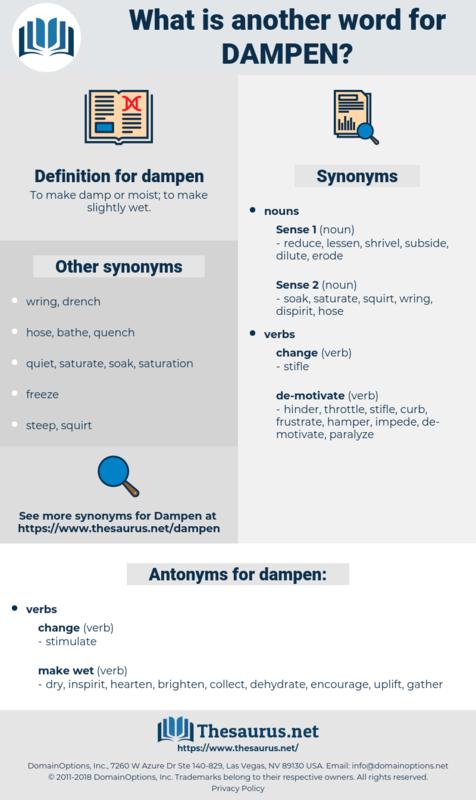 To make damp or moist; to make slightly wet. mitigate, Mitigating, discourage, reduce, reduced, reducing, lessen, suppress, undermine, impede, soften, curb, diminish, assuage, hinder, curtail, stifle, constrain, hamper, impair, allay, amortize, depress, deter, appease, minimize, repress, quell, inhibit, erode, moderate, cushion, jeopardize, affect, ease, ameliorate, de-escalate, contain, defuse, frustrate, embarrass, counteract, endanger, slow, relieve, stem, temper, placate, impinge, soothe, combat, Combating, dilute, halt, depreciate, stop, decrease, minimise, restrict, cool, undercut, rein, offset, counter. dry, inspirit, hearten, brighten, collect, dehydrate, encourage, uplift, gather. warm, heat, aid, free, increase, liberate, assist, help. parch, abet, energize, cheer, rejuvenate, magnify, embolden, consolidate, enhance, whip, excite, refresh, buoy, amplify, whet, electrify, revitalize, invigorate, provoke, trigger, instigate, desiccate, galvanize, reawaken, inspire, strengthen, fortify, spark, quicken, animate, inflame, vitalize, incite, intensify, redouble, dehumidify, brace, arouse, reactivate, regenerate, beef, kindle, rekindle, resuscitate, ferment, augment, enliven, rouse, heighten, resurrect, boost, foment, fire, recharge, reanimate, vivify, sharpen, scorch, stir, renew, charge, sear, Reawake, deepen, lift, revive. They liked Ford when he was sober, and so they hated to shoot him, though that seemed the only way in which they might dampen his enthusiasm for blood. Here's something to dampen your enthusiasm. suppress, retard, check, delay, inhibit, bottle up, weaken.